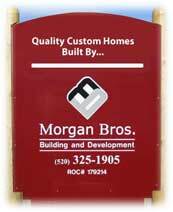 Why Choose Morgan Brothers For Your Project? Building a home is a fun and invigorating process. Too often a clients experience is one of frustration and unfulfilled promises. Morgan Bros. has developed a pre-build process and work-in progress system for eliminating guesswork perpetuated by the lack of organized communication. We are organized! We have building systems in place that insure our ability to deliver on our commitments. Typical construction schedules dictate we schedule with our contractor/partners 3-4 weeks prior to the actual execution of work. Our construction schedules are not random or haphazard. We do not quote delivery dates that we cannot meet. We allow for delays, they are a part of the construction business. We will not use delays as an excuse for being late. We will deliver on time. Obviously, the quantity and complexity of change orders as determined by the client will effect the schedule. We are professionals. We partner with professionals, not low bidders. Our contractor/partners use superior materials, pay their technicians competitive wages, and deliver on their commitments to Morgan Bros. The majority of our contractor/partners has been with us for many years and has been chosen by their ability to stand by their work long after the clients have moved into their new home. The term is tossed around like a hot potato but it is appropriate. We deliver superior quality beginning with the way our homes are designed, the contractor/partners we work with, the materials we specify for a Morgan Bros. home and the on-site supervision/project management activities of our superintendents and foremen.